The development of the Rivale is the pinnacle of decades of experience in helmet construction and design. With the Rivale, MET’s engineers have redefined the parameters of aerodynamic efficiency via meticulous hours spent in the wind tunnel and incorporating athlete feedback from Team MTN Qhubeka. The streamlined and compact shape provides unbeatable low drag performance for its class with a saving of 3 watts at 50km/h. Utilising the Venturi effect, the strategically positioned vents allow for the maximum intake of air by pulling the air through the helmet to the rear exhaust vents. Rivale’s construction is based on an innovative design approach that focuses on the key performance parameters of the helmet making it compact, lightweight, ventilated and superiorly aerodynamic. Safe-T Advanced, MET’s top of the line fit system, provides the best weight and comfort ratio. The contact points have a larger cradle surface increasing comfort and are also designed to keep weight low and allow perspiration at the back of the head.The polyurethane soft padding improves the fitting affording a comfy head touch. Breathability and comfort are extremely important, that’s why the Rivale features Airlite straps which are 15% lighter than a standard helmet strap. 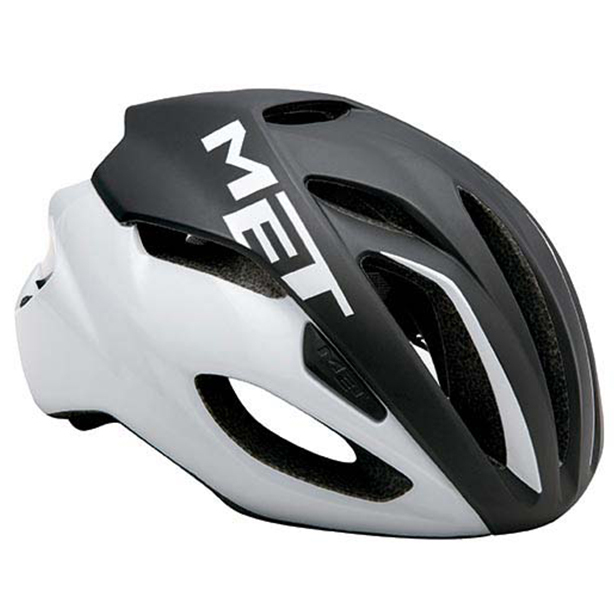 Very sleek helmet design which ensures comfort and more than adequate ventilation. Excelent helmet. Light and aero. Thanks! Very comfortable helmet, fits my head snugly. I very rarely find helmets that fit my head shape, but this one does. Just received the helmet today...all I can say is WOW !! Incredible fit and extremely light weight...looking forward to my 40k ride this coming Sunday to give it a good road test in the Florida morning heat. I am so impressed with this MET Rivale, I now have to start taking a hard look at the MET Manta CVNDSH and definitely waiting for the MET Trenta 3K Carbon release in December 2017 ! Nice aero design. Easily adjustable head strap so that it fits really well making it very comfortable. Chin strap easy adjustable. Some great colours to choose from. Excellent price. Great compact helmet. True to size and very affordable. I would say that it fits perfect without hotspots and very light. I recommend the Rivale for those who wants a compact helmet and within budget.